WOW Wednesday! FORTNITE Digital Menu For Student Creation! I used menus all the time when I was a classroom educator. I used them for student differentiation, student voice, and choice, and to allow my students to be creative with multiple non-tech mediums. I didn't want the cookie cutter presentation from every single student. I wanted them to have a choice, and to be creative! Create your presentation on a cereal box, recreating the book cover as your cereal box cover. Build a diorama from a pivotal scene in the book, and explain why this scene is so important to both the plot and the characters. A shoebox full of clues from the story. Usually describing a character, plot point, or climax of events. Now, of course, "back in the day" (11 years ago when I first started teaching), I didn't have any technology in my classroom. So, the first couple menus I made for student creation didn't involve any technology. Students not only need, but they also want the ability to have both a voice and the freedom of choice when it comes to creating and presenting their content. As an educator, it would be horrible if our administration told us we could only get feedback from students using one type of tool for the whole entire year. Just like we ask our educators to be differential with their instruction, we should be asking our students to be differential with their creation and presentation! To help with this... 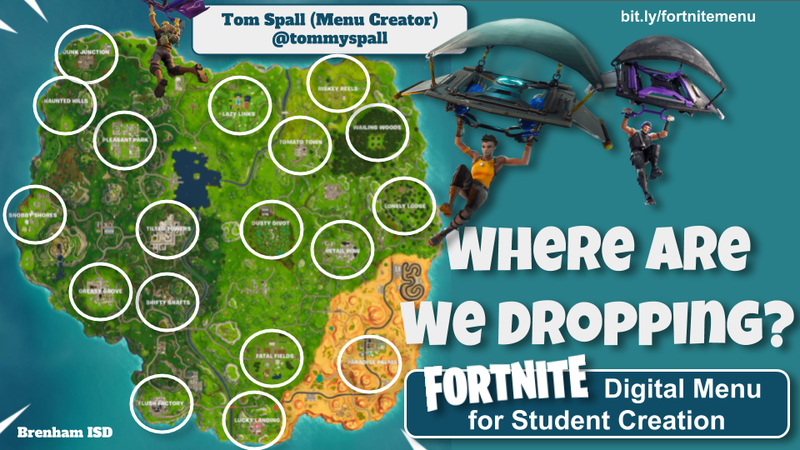 I created a Digital Menu Template for Student Creation! Feel free to use this template with any grade level, subject, project, unit, or content you teach. Make a copy of the Google Slides Template "Digital Menu for Student Creation". The template includes directions on how to use it. Have your students go to slide 3 for the menu. Every map location on the map is linked to another slide in the presentation. I also included a "back to map" button for easy navigation. Upper right-hand corner is the link to the rubric. This is the assigned rubric for this specific project. This is the only link you will need to switch out prior to having your students complete the menu. This so fun! I love it! Thanks for sharing! Can't wait to share with our teachers at a lunch and learn. use your template to do something with the game. Thank you for sharing these slides! Awesome! Thanks a lot for sharing! Can't wait to share this with my students. They will LOVE it! Thank you for making so many students happy! (and teachers too-like me)! Search Through Our Old Posts! Check out our current featured post! These tips can be used for your student as well. Teaching Tip Tuesday: 20 of the BEST "Digital Whiteboards"